I've written a somewhat longish essay about the use of POV and memory in CBS's "How I Met Your Mother," a show that, I think, is television's greatest sitcom since (and in the vein of) "Arrested Development." By longish, I mean that this essay is too long to be published entirely in one post. Therefore, I've decided to split it up into two posts, one to be published today and one tomorrow. Alas, Part 1 shall commence...NOW. Enjoy! 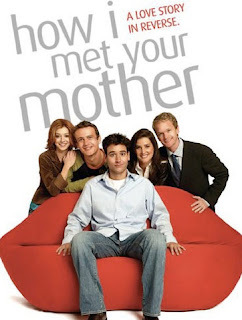 “How I Met Your Mother” is all about memory. The point of telling is twenty years in the future, and it’s the only real instance of voiceover that I love on television, because “HIMYM” is not just using voiceover as a trick or as a way for the audience to cheat themselves into the mind of the protagonist. That’s lazy writing (like in "Dexter," which I love, but that voiceover is SO unnecessary). Instead, Bob Saget’s perfectly pitched dad-tone voiceover does a lot of work, and it’s a serious part of the show’s infrastructure as a thematic building block and an experiment with memory. In fiction, first person point of view is based on perception, what the narrator remembers, how he or she remembers it, and what he or she forgets or skips over. In television (and in film), this type of POV is difficult to pull off. Most of the time, the POV in film and TV is third person omniscient, moving in and out of certain situations, and it may follow one person more closely than others, or, more often, two people, sometimes (like in "Friday Night Lights" or "Mad Men") many more. For example, in Sleepless in Seattle, we get two very solid third limited POVs, one with Annie and one with Sam, and it’s when they collide that the tension really sizzles. There’s one or two moments of limited third on Jonah, too, like when he and Jessica are purchasing the airplane ticket, or when he’s on the plane, or when he’s waiting on the top of the Empire State Building by himself. That third person, then, really zooms out and becomes totally omniscient when we see the map of the United States and the dotted lines that represent Annie’s plane rides across the country. This is a sort of basic example of what I’m talking about, how POV works in film and TV. The first person POV is usually attempted via voiceover, like in American Beauty, or in "Dexter," but usually, this fails, because even with the suspense of disbelief created right away in American Beauty when Lester tells us that he’s narrating from beyond the grave, are we supposed to believe that this is still Lester’s POV when we’re in Ricky’s house and Ricky’s father comes in and asks for a urine sample? Or that it’s still Lester’s POV when Ricky and Jane are making that video in Jane’s bedroom? Are we supposed to believe that, just because Lester is dead, he knows all this now? Doesn’t that then cause all sorts of problems for the physics of the world in American Beauty? There are serious issues here, but these issues don’t seem to matter as much in film and on television as they do in, say, a novel or a short story, because film and television have the luxury of visual distraction. American Beauty is a fantastic narrative, and without the voiceover, a perfect narrative. So why the voiceover? Because it’s a sort of trick, and it lets the audience feel like they’ve been let in on a secret that the rest of the characters don’t have access to. That’s how "Dexter" operates. We know what Rita doesn’t know, and so we will usually sympathize with Dexter over Rita, even after he’s just finished lying to her and she’s angry. In "Dexter," the voiceover gets us to sympathize with a character who might otherwise seem unsympathetic. "House, M.D." on the other hand, gets along fine without a voiceover, even though its main character is a douche bag, because unlike Dexter Morgan, who is a serial killer (and a blood spatter analyst), Gregory House is a doctor, and we want to trust doctors. We don’t need that extra boost. So in “Dexter,” maybe the voiceover helps, but it’s certainly not necessary. In fact, it might be much more interesting if we weren’t always in Dexter’s head. Okay, so we’re given J.D.’s actions. He gets up, goes to the bathroom, plays with some shaving cream. These things are funny because of J.D.’s voiceover, his interiority (or interior monologue) in the moment. There’s a small tension when J.D. tells us in voiceover that it’s his first day and that he’s nervous, and then he says outloud to the mirror, “I’m the man.” We’ve already got a little inner turmoil here. There’s already some conflict, because WE know that J.D.’s nervous, because of his interior voiceover, but his actions reflect confidence, and we’ll keep watching, because we want to see how things play out. 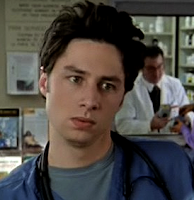 The voiceover in "Scrubs" creates a different kind of tension than it does in “HIMYM”, but it’s still doing a lot of work and is, in its own way, necessary. It’s a self-reflective voiceover, and it allows for quite a bit of silly stuff to happen (because this is J.D.’s head, right?) without us wondering what is and isn’t real. The exagerration is in the moment. "Scrubs" is about perception and escape, whereas “HIMYM” is about memory, and what it means to have a memory, and how memory works. Sometimes I like to "eat a sandwich" and read your blog. Keep it up.